Being a true die hard fan of RTS ( real time strategy ) games, I had to give MechCommander 2 a try. The original had come out a few years ago, but I had missed out on that one and didn’t want to repeat that error. I’m a little behind the rest of the press pack on this review, but I was slow installing it. On the surface MechCommander 2 appears to be a limited RTS title, but just like your mother says it’s what’s inside that counts. After an uneventful install I fired up the game and was greeted by a standard load menu. Two single player options available; training or Carver V. It seems the game is set up to handle additional missions, but that must be at a later date. I chose the training and became acquainted with the controls and functions of the game. After four easily followed tutorials I was ready to command a group of Mechs. Starting the Carver V campaign forced me to watch a group of FMV ( full motion video ) sequences giving me the gist of the story. Carver V was a planet that was to be the battleground for three Houses, mercenaries led by me and local resistance. For a better introduction to the Battletech universe check out the MechCommander 2 website. From there I proceeded through 23 missions to a victorious conquest of the planet. You are a mercenary Mech Commander that leads a group of pilots through planned objectives. Each mission you pick which pilots will man what Battle Mech, your constraints being tonnage allowed. As usual, you start with a small pool of each and gain access to better equipment as the game progresses. Some unique aspects include experience and skills for your pilots, plus battlefield acquisition. At the end of each mission surviving pilots gain experience that improves their abilities, plus moves them towards specialized skills that you pick from a list. Skills vary and aid missions, but I found overall experience made the biggest impact. Recovering fallen Battle Mechs from the battlefield is a nice feature; anything you lost or defeated can be purchased for a discount and deployed or sold. Money comes into play by purchasing new Mechs or modifying existing designs. Again new weapons are added as you progress, so new Mechs and new modifications abound. Let’s look at gameplay. The screens is fairly free of clutter, with information such as objectives and Mech specs available as overlays. 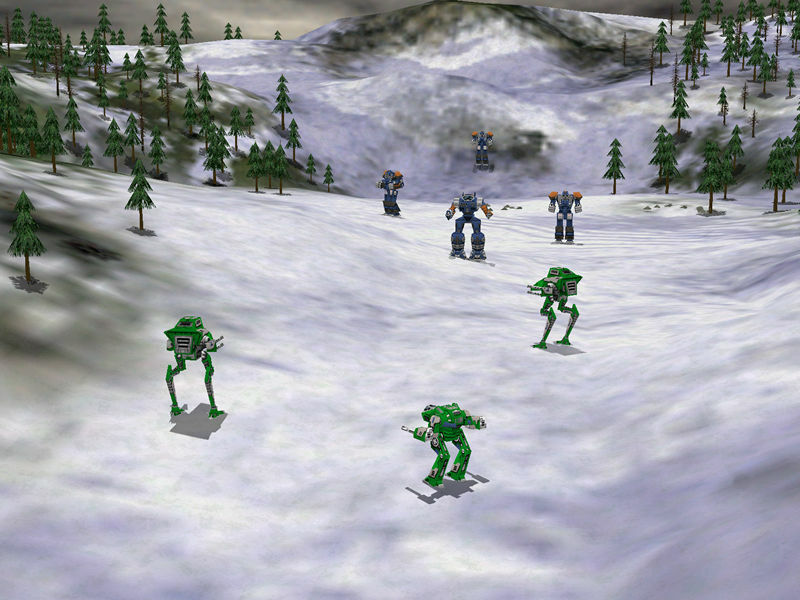 Once the mission starts you can group your Mechs by using CTRL plus numbers 1-9, as in all RTS games. Mechs are broken down into short, medium and long range so this helps when attacking your targets. Move in the long range Mechs, start the attack and meet resistance with medium Mechs first followed by short range bruisers. Battles go as you’d expect: select your units, furiously click to attack and move on. Resource points, collected by capturing enemy warehouses and supply trucks, can be used to call down support vehicles such as repair trucks, stationary cannons or new pilots. This is the best way to take fallen Mechs, as resource points cost nothing and can get you a fighting unit quickly. You can’t get more Mechs from your group during a mission, so manning fallen Mechs can really turn the tide. Graphics are top notch, with various resolutions and colour depths available. Take a look at the screen shots and judge for yourself. I played at 1024×768 at 32 bit colour depth, as I do with every game. With a lot of activity on the screen I found everything getting a bit jerky, which is surprising with my main system. Sound got the job done, but it wasn’t surround which we’ve all become used to. Why don’t RTS games support surround sound? Hearing enemy Mechs moving in behind me could have helped, but probably not much. Multiplayer is handled, surprise, on the Microsoft Zone. Find some competitors, start a game and choose a colour. 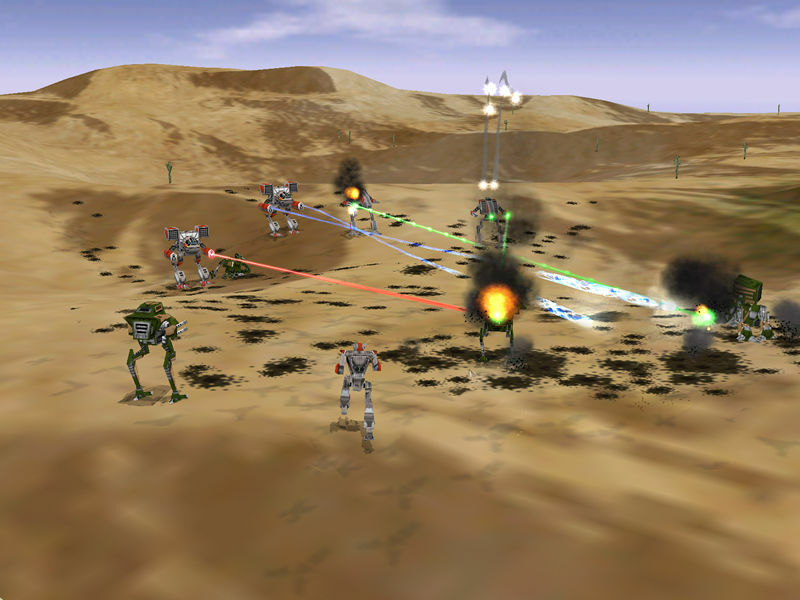 Same great gameplay with up to eight players in head to head action. I didn’t get into it too deep, but it’s what you’d expect. All in all a nice diversion from the standard RTS fair. Don’t take my word for it: grab the demo and see for yourself. Prepare to be surprised and entertained. Editors note: this review was migrated from the old eBabble.net site and the photos updated. Originally published October 19th 2001.